Adm. Bill Moran has been nominated by President Donald Trump to become the next chief of naval operations, the Navy’s most senior officer, the service announced Thursday. Moran would become the 32nd chief of naval operations, if confirmed by the Senate. He has been the vice chief of naval operations since May 2016. As the Navy’s top admiral, he is a member of the Joint Chiefs of Staff and reports to the secretary of the Navy. Richardson is scheduled to retire in the summer after 37 years of service. He has been the chief of naval operations since September 2015. Moran is from Newburg, N.Y., and graduated in 1981 from the U.S. Naval Academy in Annapolis, Md., with a bachelor’s degree in naval science. He also earned a master’s degree in 2006 from the National War College, located at Fort McNair in Washington, D.C. Serving as a pilot, Moran flew P-3 Orion patrol aircraft. He previously served as commander of Patrol Squadron 46 and Patrol and Reconnaissance Wing 2, according to his official biography and the Navy statement. He has also commanded the Patrol and Reconnaissance Group and was on the staffs of the chief of naval operations and the commander of U.S. Indo-Pacific Command. His military awards include the Distinguished Service Medal, the Defense Superior Service Medal and the Legion of Merit. It was also announced Thursday that Vice Adm. Robert Burke was nominated by the president to become the Navy’s 40th vice chief of naval operations. He is now the deputy chief of naval operations for manpower, personnel, training, and education. If confirmed, Burke will be promoted to the rank of admiral, according to the nomination notice received by the Senate on Wednesday. A Portage, Mich. native, Burke has a bachelor’s and a master’s degree in electrical engineering from Western Michigan University in Kalamazoo, Mich., and the University of Central Florida in Orlando, Fla., according to his official biography. 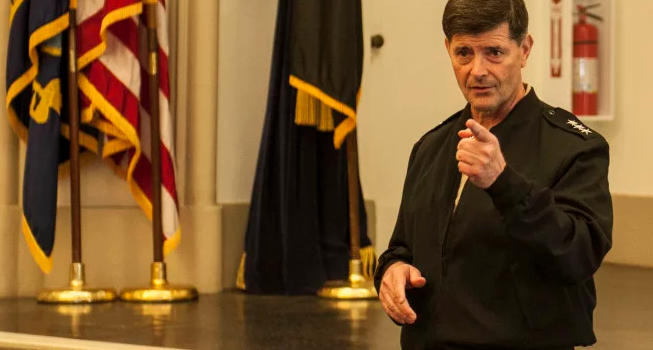 He has served on attack and ballistic missile submarines, including the USS Von Steuben and the USS Bremerton, according to his biography. Burke has also commanded the USS Hampton and was the commodore of Submarine Development Squadron 12. Burke has also served as the director of operations for U.S. Naval Forces Europe-Africa and commander of Submarine Group 8. His military awards include the Defense Superior Service Medal and the Legion of Merit.